A departmental class A3-sized document scanner that features 80ppm (160 ipm) scan speed, 100 sheet feeder and 8,000 page per day duty cycle. Featuring a scan speed of 80 pages per minute, 160 images per minute in duplex mode, a 100 sheet feeder and a daily duty cycle of 8,000 pages per day, the SmartOffice SC8016U is designed for applications requiring frequent scanning of large document batches. The SmartOffice SC8016U scans mixed batches of documents without the need for separating or sorting. Embossed cards, such as IDs or driver licenses, and any sized paper document up to A3 size and 200” long can simply be stacked in the 100 sheet feeder. The SmartOffice SC8016U’s paper handling system coupled with Plustek’s advanced image processing provides you with automatically sized and exported images or PDFs. SmartOffice SC8016U’s A3 sized feeder easily handles documents from 2"x2" to 11.69"x200". Single-touch customizable button automates up to 9 frequent scanning jobs (e.g., Scan to PDF, Scan to file, email, network share, copy, etc.) The innovative automatic wake-up function turns the scanner on as soon as documents are placed in the feeder. The ultrasonic sensor detects double feeding of original documents during scanning. 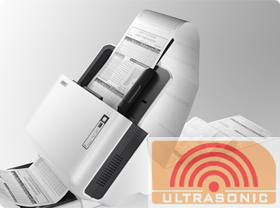 The ultrasonic function can be turned off when scanning document with labels, sticky notes, or taped receipts. 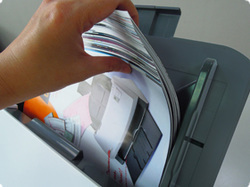 This innovative design prevents double feeding and effectively scans documents of different weights or thickness. Thanks to double-feed prevention, optimum reliability is assured even when scanning high volumes of documents.